As a family owned and operated business since 1948, Tannenberg Pet Resort provides the best care for your pets. Our friendly, clean environment welcomes your four-legged family members to their home away from home! 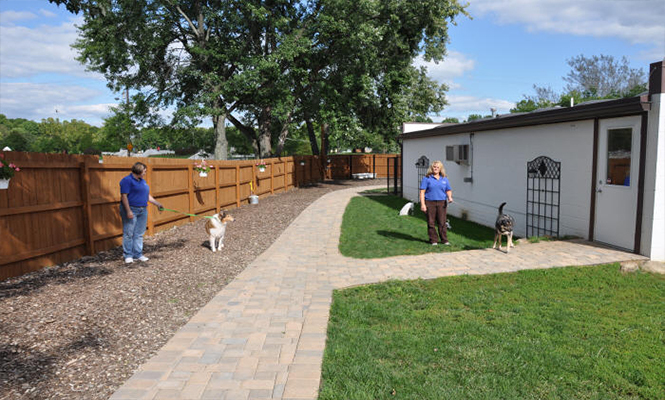 We offer a quiet suburban setting adjoining a city park and strive to keep your pet safe, healthy, and happy in your absence. We give you peace of mind knowing that your pets are well-cared for and let your travels be worry-free and enjoyable! Closed for check-in and check-out on New Years Day, Easter, Memorial Day, 4th of July, Labor Day, Thanksgiving, and Christmas Day. TOURS AVAILABLE AFTER 12 NOON. Two daily individual walks on a leash provide safe, personal, hands-on attention for each dog. Our boarders also enjoy their solo time in individual exercise runs each day, giving them ample time to play at their leisure. High-quality food is always provided for your pets. We feed Bil-Jac, a fresh dog food, to our dog boarders and Purina Cat Chow to our feline clients. Payment is required when services are rendered and/or at departure. We accept VISA, MasterCard, Discover and Cash. Have questions? Ready to make a reservation?